Brazilian Olympic show jumping champion Rodrigo Pessoa has been officially disqualified from the 2008 Olympic Games after an investigative panel rendered its final decision in the prohibited substance case involving the horse he was riding at the Games. Pessoa’s mount, Rufus, a 1998 Dutch gelding, tested positive for a banned substance, Nonivamide, which is a pain reliever and an agent that can be used for hypersensitization purposes. 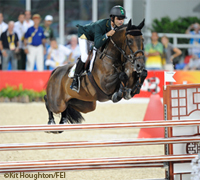 The panel, formed by Federation Equestre Internationale (FEI) appointed members, determined that Pessoa is officially disqualified from the 2008 Olympic Games and will be suspended for a period of four and half months through January 10, 2009. He is also being fined. Pessoa, who finished fifth overall in the Individual show jumping competition during this summer’s Olympic Games in Hong Kong, has a long list of championship wins to his name, including a Team bronze medal from the 2000 Sydney Olympics and an Individual gold medal from the 2004 Athens Olympics. In reaching its decision, the FEI panel concluded the substance at issue–Nonivamide–was a “Medication Class A” rather than a “Doping” substance based on its interpretation of the list of prohibited substances. the fact that the actions taken by the Brazilian show jumping team to control all possibilities of contamination and actions taken following the positive finding to reveal its source were not at the same level as established by other teams at the same or similar events. and the fact that the substance is a newly detectable substance that is often used by riders for legitimate therapeutic reasons. Rodrigo Pessoa has 30 days to appeal this decision to the Court of Arbitration for Sport (CAS). Hope the horse is ok! That’s really too bad for Pessoa. Sometimes I think the drugs are over banned.